This would be last Ghost of the 1997 summer tour. After falling in the second set 3 days earlier at Star Lake, Ghost moves back to the heart of the first set. Phish decides to play their new monster jam vehicle right away at the summer festival. The segue into Ginseng Sullivan is not a true segue, but it is fun and I decided to include it. An alright beginning compared to a lot of the other summer ’97 Ghosts. Fishman is particularly loud in this version. There is a good tempo, and it’s a bit more upbeat than previous Ghosts. Page gets into his usual funk during the solo section with Mike slapping along side him, very solid. The pause is about average, and the drop in is horrible…Ouch! The band does recover quickly, but the vocals are not my favorite. Mike and Trey start to get funky from the very beginning. They find a nice space to groove in at the 3:30 mark. Fishman leads them into this nice pocket and everyone falls in line. It is balanced right away with Trey just a bit out in front, he has a great tone and Page counters him with a mix of organ and clav. Gordon develops a great bass line while Fishman lays a smooth beat to hold this jam down. I love how this jams starts! They find this great groove and hold it down right from the beginning. It’s only the first set of Phish’s festival and the dance party is in full force. There was no messing around…jam begins…funk is laid down. This is the stuff I love, Phish locked in, with full band balance. My ear moves back and forth between each band member, while my feet don’t stop moving. At 5:25 Trey plays a lick that reminds me of one he had played in a previous Ghost. I can’t remember which one. If you remember, please post in comments below, thanks! That great lick is the beginning phase of the band taking it up a notch. Trey leads with that lick, and then Mike comes blasting in with a bass run. Trey is in more of a lead position here. I love Trey’s playing from the 5:15 mark forward, he is leading while not overplaying. At 6:15 he starts to repeat a cool riff and it allows Page to pivot and figure out where to go next. Page start to use his entire rig while Trey plays that same riff. In doing so Page is able to move back and forth and has the freedom to try everything out. It adds so much texture to the groove. Page alternates between the clav and the piano starting at about the 6:39 mark. Gordon also is increasing the number of notes he is playing here as well. By the 7:04 mark Page has moved exclusively to the piano. Fishman starts to vary his rhythm, giving this groove some new life. At 7:50 Page drops a gorgeous melody into the mix. At 7:57 Page almost plays the theme from “Peter Gunn”. At about the 8:20 mark the jam begins to break down and move into a different section. Fish is driving the jam downward into the abyss. The rest of the band moves slowly with him. At 9:08 Page plays something that sounds like it would come from an evil circus clown. Trey layers some murk into this downward spiral, while Mike has some darker sounding runs. By about 10:20 the band has moved pretty far into the smog. At the 10:45 mark Trey starts to peak out from the cloudiness and lead the band out of the smog. Trey really starts to take charge and Page follows his move towards the light with some beautiful piano sounds. Trey and Fish are building this jam back up measure by measure. Gordon is blending a great mix into his work. There is great teamwork in this build, however Trey’s star shines the brightest. His classic 1997 sound is on full display, yet at no point does he overplay. Trey leads yet still allows the other band members to shine. At 12:15 Page drops beautiful harmonies into the build as Trey tones it down letting his notes hover out. As Trey’s notes start to fade at 13:07 Page plays some chords on the organ and the jam begins to simmer down. At 13:12 as the jam moves into nothing, Gordon unleashes some monster notes. At 13:30 Page counters with some awesome organ playing. Trey is laying thick layer upon layer on this nothingness. Super cool section! A couple times it seems like Phish may grab a hold of this and end with a fire section. Instead they keep the outro going and work on creating more layers to it. Some dynamite work from Fishman here, he is all over the place. This section makes me think of driving through a foggy storm. Taking things slow and alert, and then seeing cool lightning bolts in a distance. After the outro ends Ginseng Sullivan picks up right away. Interesting choice, but a great call in my opinion. The change from the stormy Ghost outro to fun Phishgrass is a great contrast. A very solid Ghost to cap off the Summer ’97 tour. I love the flow of this Ghost and how early it finds a fantastic groove. The first 6 minutes are some great full band grooving. After that, it moves well into the darkness, climbs out, then a super cool outro. No section really hits that next level, but the entire thing is solid. Summer ’97 has some standout Ghosts and some others that fall a bit short. 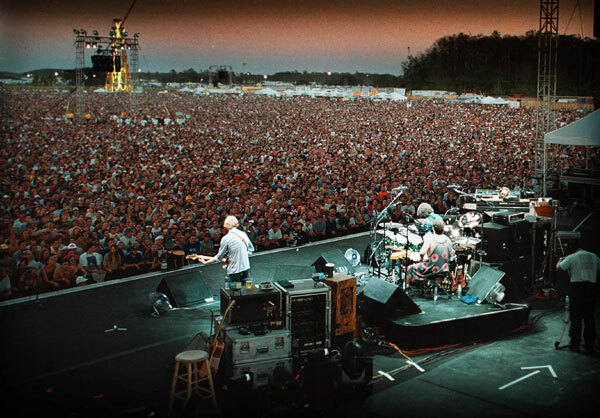 One thing is for certain, Ghost had become a major jam vehicle….Fall ’97 begins tomorrow…. My first Ghost. SO much fun, daytime set funky festival Ghost. I was 19 going on 20 this exact weekend. Never heard this song at all and was wondering what it was and what is was all about. Years later, one of my favorite Phish tunes. Thanks for the blog. I read it everyday. Fun following Ghosts.